The fact that Suunto bombed, at least from an initial firmware setting on the Sunnto Spartan Ultra isnt a secret. Over time the firmware improved, but that didnt detract from the hardware issues. 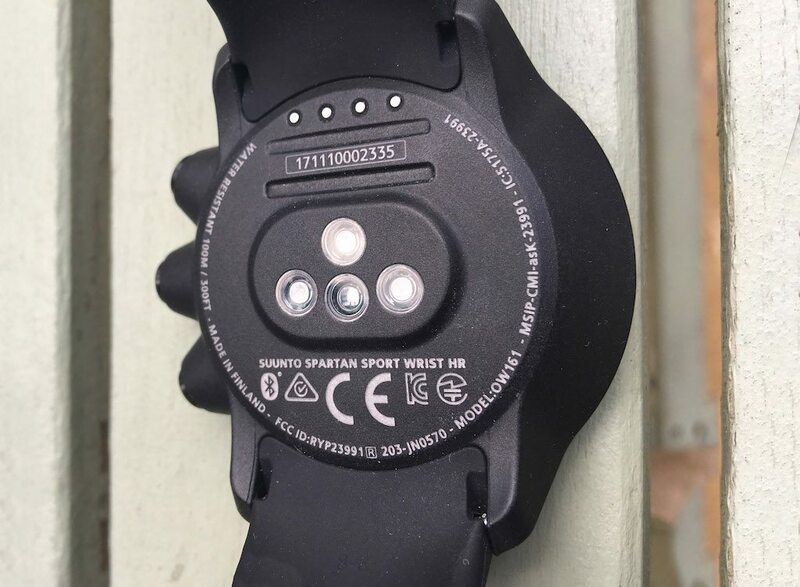 The Spartan Sport HR – added a very good, it must be said, optical heart rate onto the back of the watch, and polished the firmware to make a reasonable “also ran device” but still quite a distance from what would be termed a good sports watch. As I type this I’ve only recently seen Star Wars: The Last Jedi and I will attempt to keep the Start Wars references to a minium, but once a geek…. The Suunto Spartan Trainer Wrist HR…. ok enough of that! From now on, the watch will be referred to as the Suunto Spartan Trainer, which is still a little long, but it will do!!! The Suunto Spartan Trainer deviates from the design theme of the higher end Suunto Spartan watches in that save for the top two models, the trainers are all polymer resin, without metal. We also see a change in colour availability to a less sombre colour palette. I’m quite a fan of the Coral colour actually, although I think pushing further out, a yellow version would look very nice! A BRILLIANT (in my mind anyway) option with the more costly Suunto Spartan Trainer models is that of a straightforward steel bezel. 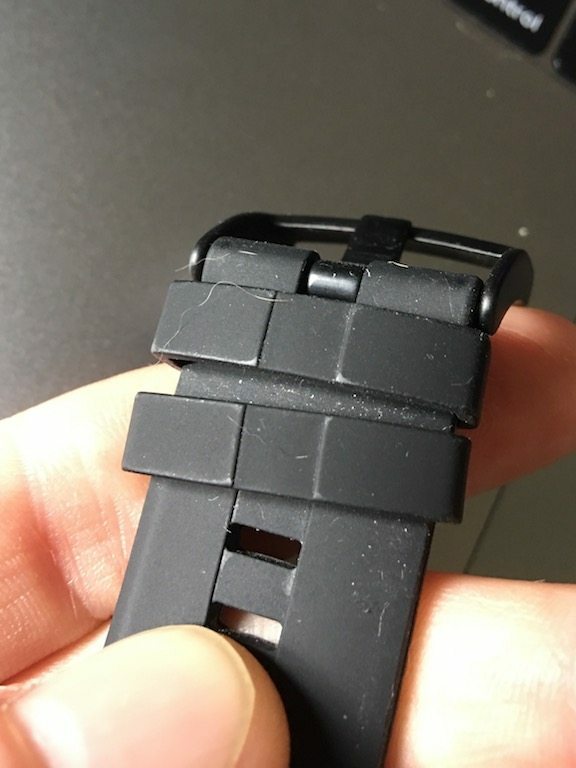 My point is, Suunto are offering the watch without a painted bezel, which is great for my potential OCD (I hate scratched paint on gadgets etc – I highly regret buying a “space grey” Macbook). It enough of that, what do we actually get? Both appear to be pulled out of the from the Ambit catalogue. Now I have a theory… PERSONALLY I feel that Suunto had enough of the Spartan getting a bad wrap, and looked back to their past glories, with the Ambit line, and produced an updated Ambit, with Suunto Spartan sauced dripped on. A small raid to the parts bin has also allowed for the Suunto Spartan Trainer’s class leading price which will likely make a lot of people take a look at the Spartan. Again this is just a personal opinion, but I’d love to hear what you think in the comments. The additional buttons are needed due to the dropped the touch screen, but as you light have guessed I think is a MAJOR benefit in day to day use of the trainer. The Sparatan touch screen to my mind duplicated functions and brought practically zero benefit to the watch. The Suunto Spartan Trainer has taken a similar line to Polar and Garmin, with modular sensors which are inserted into the case, which has likely aided the Trainers low price. All the different optical sensors systems employed today, are now sufficiently slight you cant really tell you are wearing them. Which is quite a journey when looking at something such as the Garmin Fenix 3 HR, which would always leave a distinct impression on my arm. The loss of touch screen I really think helps the Suunto Spartan Trainer and you start to feel that right from the start during the setup – the system feels less laggy. A bluetooth connection to your phone, once confirmed in the Movescount app, will allow the Suunto Spartan Trainer to receive smart notifications from your phone. Whilst you can scroll through longer messages, there is no dedicated message menu. So when you move from one message to another, there is no way of going back to review to the older message. Polar, on everything other than the M600, has the same lack of menu, but that fact you can review messages later on the current Garmins does give the company a distinct advantage in the smart watch realm. But just like the smart notifications for a text message, once you have seen the missed call. That’s it. The notification disappears after about 20 secs or so, not to be seen again. If you hit your goal, in my case of the default 10,000 steps, the Suunto Spartan Trainer will buzz and give you an overview of your activity that day – yes I had a VERY early start the day this photo was taken!! So a quick winter spin, with winter beard utterly failing against the biting wind. But enough with moaning about the cold weather – what was the heart rate data like? It’s well known that cycling can, for various reasons, prove a challenge occasionally for optical HRM devices due to the vibrations through the wrist – but here all units did well! Well, the Garmin Fenix 5 does it’s own thing, but nothing new there, the 4iiii, Spartan and OH1 all tracked very well once things had warmed up after the first couple of minutes, and only a couple of blips along the route. I think our of the box, strongest suit that the Suunto Spartan Trainer has is running. Especially as there is running with power built in. Remember Suunto were the first to work with Stryd, and simply things work as expected when you hit the run with power activity. Right, off for a run! As alluded to above, some niggles still remain. You have to select a particular exercise eg “Running with power”. You can’t merely attach the Stryd pod to the running exercise. Different sensors, need different apps, so a running basic and a run if win power app exists which is a rather unusual way of dealing with things. The same is also true of cycling with power meters, which also needs two different exercise apps – basic and with power. Well on the first run, the Suunto Spartan Trainer didnt really cover itself in glory which is an oddity give how well things tracked during the cycling portion of the testing. The Suunto Spartan Trainer does seem to wake up and “get with the program” after about 13 minutes, but that’s over half way in to the run!! So after a few more tests, I’m sorry to say that the similar picture was maintained. I even stopped to stretch in the same place to try and keep the test fair! This time the Suunto Spartan Trainer is more on the ball, certainly compared to the first attempt. Now we are pretty much keeping in line on the troughs, but flying off the handle regarding the upper heart rate zones. However I had a thought as those numbers looked a little familiar to me, so I went back to look at some more data. Unlike standard chest straps which record you pulse through electrical impulses, optical HRM’s are looking for changes in optical signals, which could also be induced by vubrations through the sensor device, such as high cadence running. What i think has happened is the suunto has latched onto the vibration from my cadence rather than the pulse from my wrist. Hopefully this is someting which can be cleared up in future via firmware tweaks. 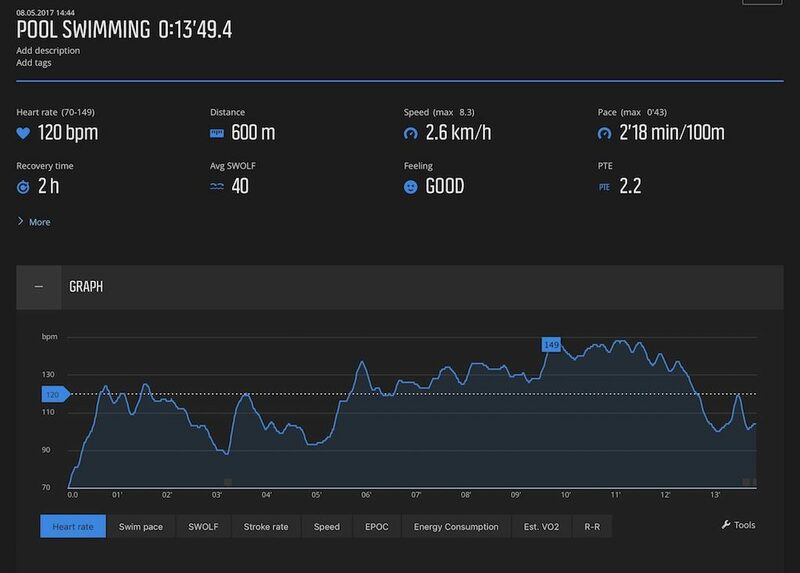 However unlike other optical HRM Suuntos’ you can now access live heart rate data in the pool, or on your open water swim. Although between you and me, I’m not sure how useful instant optical HRM is whilst swimming. I’m normally a little too busy flailing my arms to check my watch. Heart rate zones with an audio feedback I think are more than sufficient thanks! When you go for a pool swim, before hitting start there is an option menu which will allow you to select your pool length – either from the default 25m, 50m, and 25 yard and 50-yard pools, or custom pool size from 15 m all the way to 330m!!! As an interesting aside, the watch is able to detect your swimming style, which is a nice feature…if it wasnt for the fact it also thought I was apparently just bobbing around for 10 mins during my swim! One issue that comes to the fore with cycling is sensor pairing. Now most people with have one heart rate monitor, and if they are lucky one foot power pod. But it is not unusual to have more than one bike. Similarly, in the Zwift World it is not unusual to have more than one power meter. That being one for the bike, and possibly one in the smart turbo and that causes a problem for the Suunto Spartan Sport HR, as it doesnt like multiple sensors – for example here is the Kinetic Road and Roll powered up, and both the PowerTap C1 and Garmin Vector 3 pedals sending out signals. 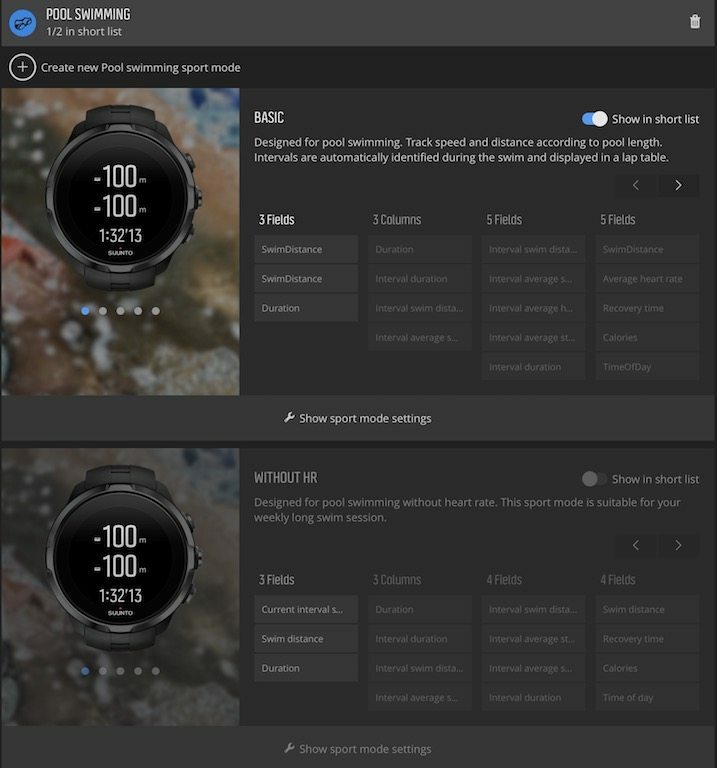 The Suunto Spartan Trainer searches and connects…to something but doesnt tell me what! So we’ve already covered cycling, and running, but it seems reasonable to compare the how the heart rate sensor functions when doing a few Zwift intervals. Here zoomed in to show the improved variation. For some reason the trainer is reading fractionally high compared to ther units, but otherwise we have a trace comparable to both the POLAR OH1 but also the 4iiii viiiva. I’ve been rather negative about the Suunto Spartan in the past, and in all honesty, they have been watches, I have not missed when they have been charging and things like that – not a good sign. I’ve enjoyed reviewing the Suunto Spartan Trainer Wrist HR, not only because Suunto have seemed to have turned their ship around, but that the Suunto Spartan Trainer Wrist HR works. As an analogy, it is the VW Golf of the current triathlon world. It’s not got the biggest bells and whistles, or frankly some of the smartest software or hardware. But it works. Everthing now works, just so. There are still a couple of minor niggles with the trainer, as I’ve illicited above, but they are minor when we look at the overall package. Someone might raise the point about the optical HRM when running, but that isnt a deal killer for me, when overall, the trainer works. Heck my personal day to day watch is a Fenix 5, and as I’ve documented at length the Garmin ELEVATE sensor is pretty poor, but that is merely one point on an overall watch which meets my needs otherwise. Now there bit that gives Suunto their home run is pricingm – the lowest I can find the Suunto Spartan Trainer Wrist HR is £189, for a fully fedged triathlon watch. My normal recommendation for straightforward smart watch with some tri capabilities is the Polar M430, at £159. The M430 is still probably the best running watch out there, but as a whole package the Suunto Spartan Trainer Wrist HR is now going to be my number one recommend. Which leads me to a slightly bizzare award, I’m going to give the Suunto Spartan Trainer Wrist HR 3/5, there are still several frankly lazy niggles in the unit, probably biggest of all for me is with regard to sensor pairing. BUT I’m also going to deploy the “Recommend” stand as well – as things can only improve through firmware.